Though in story The World Is Not Enough is not one of the best Bonds, pound for pound it delivers as much thrilling action as any of them. 128 min. MGM Distribution Company. Director: Michael Apted. Cast: Pierce Brosnan, Sophie Marceau, Robert Carlyle, Denise Richards, Robbie Coltrane. By naming itself for the Bond family motto, the nineteenth James Bond film says everything about the film's conflicting impulses. Wanting it all, The World Is Not Enough is a sort of James-of-all-trades, master of some. Under the direction of an unsually high-toned filmmaker, Michael Apted, this Bond has some fabulous action and some intriguing character development for Bond, but also a disasterous Bond girl in Denise Richards, the most flouncy, most buxom nuclear physicist you've ever seen (I guess the Bond producers are, not unreasonably, assuming we've never seen any, so why not?). The film gets off to one of the franchise's most satisfying starts, with a double-whammy of action sequences: first a stunt leap in Bilbao, Spain, and then a speedboat chase on the Thames, the latter symbolizing the series' national pride as the jewel in the crown of the British film industry (other locations include Baku, Azerbaijan and Istanbul, Turkey). The spectacular excess of the opening sequence is hard to top, but Apted gives it the old college try in a later ski sequence with parahawks, a creatively super-sized variation on the cliffhanger threat of a buzzsaw in an old mill, a screw-tightening-deathtrap, and a variety of other scenes involving speeding vehicles, explosions and shoot-outs. Though in story The World Is Not Enough is not one of the best Bonds, pound for pound it delivers as much thrilling action as any of them (the gadgets are also in play, from a souped-up speedboat to X-ray specs, a natural for the pervy Bond). The screenplay by Neal Purvis & Robert Wade and Bruce Feirstein concerns Bond's investigation into the death of British oil tycoon Sir Robert King (David Calder), a friend of Bond's boss "M" (again played with sterling steel by Dame Judi Dench). Bond feels personal responsibility, and even as he frets over "M"'s ability to stay objective, Bond's own judgement may be clouded. 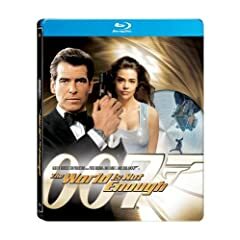 As is often the case for the insatiable lover, Bond's own judgement is further threatened as he falls for King's daughter Elektra (Sophie Marceau), who now oversees the production of her father's latest project: an oil pipeline being constructed in the Caspian Sea. Fans of Ancient Greek tragedy (and Freud) will find her name a tip-off of yet more trouble to come. Meanwhile, a formidable villain emerges in ex-KGB anarchist terrorist Renard (Robert Carlyle). Renard has one of the most intriguing motivations for a Bond villain. With a bullet slowly worming its way into the center of his brain, he feels no pain, but also has a death sentence: as such, he's a baddie with very little to lose. The script wisely levels the playing field by giving superspy Bond a physical weakness: a bum shoulder incurred early in the picture that continues to make his exploits in bed and in the field just a bit more challenging. The universe of Bond characters has rarely been so busy. Besides a requisite second Bond girl in Dr. Christmas Jones (Denise Richards), that rare nuclear physicist who wears short shorts on the job, Robbie Coltrane returns in the comic-relief role of Valentin Zukovsky, and John Cleese is introduced as "R," "the young fellow" being groomed to replace gadget-master "Q" (Desmond Llewelyn, in his graceful final appearance). Humor is another strong suit of this entry, with witty (and often pun-ny) dialogue designed to make us groan with glee. Speaking of paging Dr. Freud, Bond delivers this winner to always-bridesmaid/never-bride Ms. Moneypenny (Samantha Bond): "The story of our relationship. Close but no cigar." And campy though it may be, the kiss-off line that ends the film is classic Bond smarm. Still, when a life-threatened M is told to watch the clock like Dorothy in The Wizard of Oz, it's a reminder that time was ticking for a series thought to be decreasingly relevant in the 21st century. 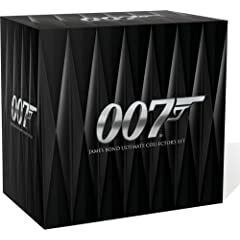 As MGM puts it, Blu-ray was made for Bond! While that's clearly hyperbole, the Bond discs are some of the most impressive Blu-rays on the market. 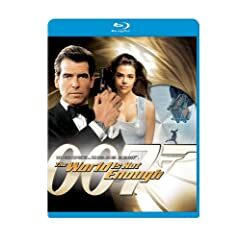 In its Blu-ray debut, The World Is Not Enough comes with an unimpeachable image: detailed in picture, tone, contrast and color to give the best possible home-video representation of the theatrical experience (minus poor projection and scratched prints). Audio is likewise definitive, in blistering DTS-HD 5.1 Master Audio. The bonus features gather all of the extras previously issued on DVD for this title, and it's a terrific package. First, you'll find an audio commentary featuring director Michael Apted, and a separate audio commentary featuring production designer Peter Lamont, second unit director Vic Armstrong and composer David Arnold. The former is most interesting, especially given the respected Apted's wide-ranging experience in the film industry, but the latter is nice for completists wanting to dig into production and post production "how'd they do that?" detail. Seven "Deleted & Extended Scenes" (12:49) come with introductions by Apted. The multi-angle Boat Chase feature allows the viewer to toggle between various cameras, giving a wealth of raw footage so the viewer can play editor. "James Bond Down River" (25:04) is a promotional featurette about the historic shooting of this sequence, while "Creating An Icon: Making The Teaser Trailer" (4:26) offers interesting insight into modern blockbuster-film publicity. "Hong Kong Press Conference" (9:46) records Pierce Brosnan meeting the press. 007 Mission Control provides the usual breakdowns of “007,” “Women,” “Allies,” “Villains,” “Mission Combat Manual,” “Q Branch” and “Exotic Locations.” "The Making of The World Is Not Enough" (15:06), hosted by Leanza Cornett, is disappointing compared to the comprehensive retrospectives on other Bond discs, but taken with the other bonus features, it reasonably gets the job done. "The Bond Cocktail" (22:52) is a chemical analysis of the Bond formula. The montage "Tribute to Desmond Llewelyn" (3:22) remembers the actor who played "Q." 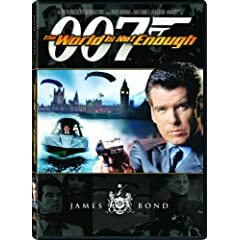 We also get "'The World Is Not Enough' Video" (4:01) by Garbage, "The Secrets of 007: Alternative Video Options" (22:31), breaking down an action sequence through storyboards and behind-the-scenes footage, the "Theatrical Trailer" (2:13) and an extensive Photo Gallery. 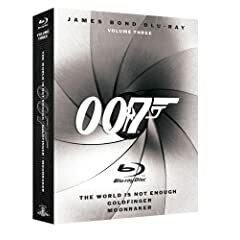 Bond fans cannot afford to be without this definitive Blu-ray edition, available separately or in a 3-pack with Goldfingerand Moonraker. All site content © 2000-2019 Peter Canavese. Page generated at 04/25/2019 03:49:34PM.